Mr and Mrs Stanesby had noticed that Barney's chin had seemed wet. They weren't sure as to the exact cause but perhaps wondered whether he had been too enthusiastic at the water container. Consequently, the fur underneath his chin had become discoloured and matted.Concerned at this development they brought him to see me. A clinical examination revealed that the damp fur under his chin was in fact due to salivary stains. From previous health records we were also able to establish that "Barney" had lost almost 1lb which represents a 16% loss of his bodyweight over the last 12 months. 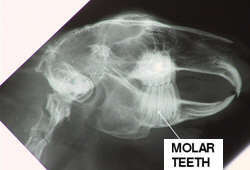 These two significant symptoms indicate dental problems - an extremely common finding in pet rabbits. Rabbits teeth, unlike our own, continue to grow throughout their lives. Teeth enamel is the hardest substance in the body and can only be worn down by opposing tooth enamel. Barney's top jaw is significantly broader than his bottom jaw. Unless there is even wear of the molars, spurs or hooks will appear at the outer edge of the top teeth and the inner edge of the bottom teeth. These jagged spikes of tooth will then dig into the tongue or cheek causing mouth ulceration and increased salivation. This is a well understood phenomenon which occurs in some horses requiring their teeth to be rasped on a regular basis. 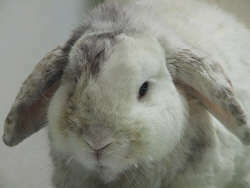 Unfortunately, rabbits are somewhat smaller and less co-operative than their equine counterparts. This means that when dental work is required a general anaesthetic is essential. Whilst this still carries some risk, if the symptoms are identified early enough before the patient becomes moribund or clinically unwell the chances of success are exceedingly good. Fortunately, Barney's problem was picked up before secondary infection became an issue. Now that his owners are aware of his potential problems they will be weighing him on a regular basis to identify any unexplained weight loss in the future.